Recently we shared two articles about Windows 8 Keyboard Shortcuts and Download Windows 8 ISO 64 & 32 Bit. 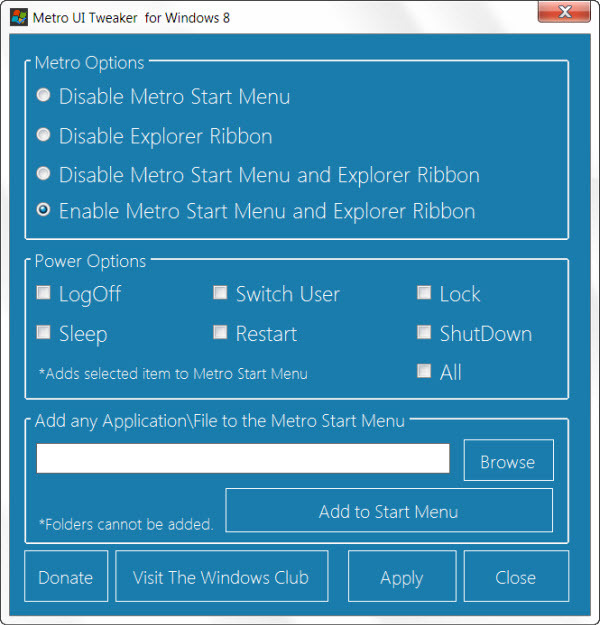 Today here we shared a new post about how you can tweak your Windows 8 Metro UI with freeware app Metro UI Tweaker. Its very easy to use this app, just download and run the app, no need to install. With the help of Windows 8 Metro UI Tweaker you can change disable or enable metro UI option, add shutdown or restart to start menu and Add any Application/File to the Metro UI Start Menu Screen. 1. Disable Metro Start Menu: Disables only Metro Start Menu Screen: This function requires editing a System File. It does not remove the file. 2. Disable Metro Ribbon: Disables only the Metro Ribbon UI: This function I discovered myself. It requires Taking Ownership of a System File. It does not remove this file. 3. Disable Metro Start Menu and Ribbon: Disables the Metro Start Menu UI, Ribbon UI, Metro Task Manager UI and the Lock Screen. 4. Enable Metro Start Menu and Ribbon: Re-enables all available Metro UI options. 6. Add any Application/File to the Metro UI Start Menu Screen: Some Applications/Files may not be available to you to add to the Metro Start Menu Screen. This program allows you to add those Applications/Files which would otherwise be unavailable. Metro UI Tweaker is available for both Windows 8 32-bit and 64-bit.